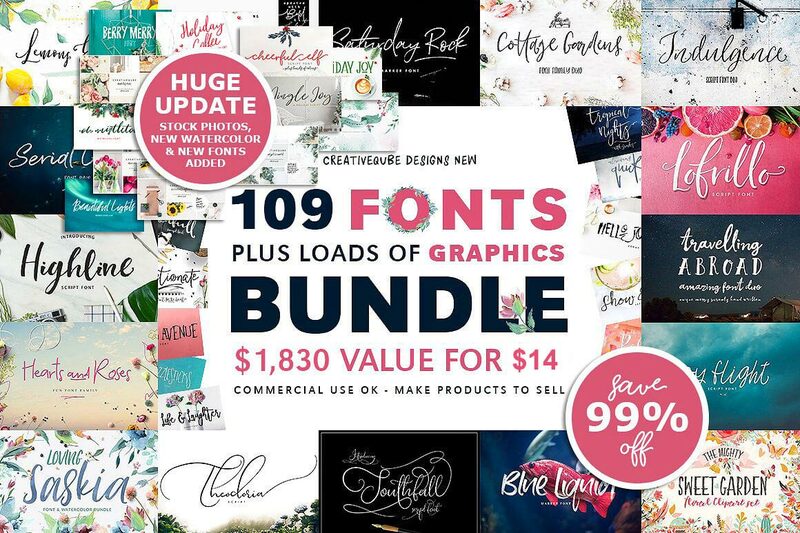 109 Fonts Bundle Plus 2000 Professional Graphics! This is one deal so incredibly discounted, you just can’t afford to pass it up! If you’re a designer, prepare to drop your jaw. Not only does this massive Design Bundle feature 109 powerful font families, but you’ll also get close to 2,000 useful graphics from watercolor textures to hand-drawn illustrations. With an extended license, you can mix and match these fonts and graphics as often as you’d like for personal or commercial products. Tons of OpenType features – stylistic alternates, swashes, ligatures and more. Around 2,000 gorgeous graphics – watercolor textures, clipart, hand-drawn illustrations, digital papers, seamless patterns, etc. Endless amount of uses – invitations, branding, logos, posters, birth announcements, photo overlays, wall art, printables, bags, mugs, T-shirts, fabric and so much more. BONUS: 6 extra picture fonts.